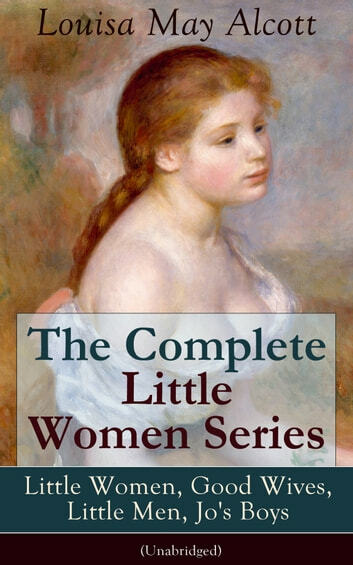 This carefully crafted ebook: "The Complete Little Women Series: Little Women, Good Wives, Little Men, Jo's Boys (Unabridged)" is formatted for your eReader with a functional and detailed table of contents. Louisa May Alcott (1832 – 1888) was an American novelist best known as author of the novel Little Women, Good Wives and the sequels Little Men and Jo's Boys. The first part of Little Women: or Meg, Jo, Beth and Amy (1868), is a semi-autobiographical account of her childhood with her sisters in Concord, Massachusetts. Part two, or Part Second, also known as Good Wives (1869), followed the March sisters into adulthood and their respective marriages. 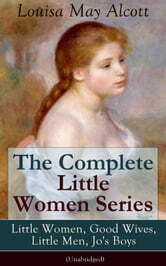 Little Men (1871) detailed Jo's life at the Plumfield School that she founded with her husband Professor Bhaer at the conclusion of Part Two of Little Women. And Jo's Boys (1886) completed the "March Family Saga". Alcott made women's rights integral to her stories, and her fiction became her "most important feminist contribution" — even considering all the efforts Alcott made to help facilitate women's rights during her lifetime.